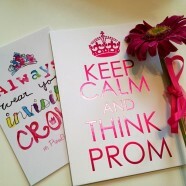 Home » Prom Fashion Show » Ready… Set… Prom! Prom is one of the most exciting nights of your high school experience and everyone wants to make it a night they will never forget. With that time of year approaching quickly, it is time to start planning for the special night. You want to make sure that you have everything in order from the dress to the limo to make sure your night is the best it can be. Start your planning by thinking about the look that you are going to go for. Try looking through fashion and beauty magazines to find a hairstyle and the type of makeup that you want to go for. Take a trip to the mall with your friends and start trying on dresses and thinking about what your budget is going to be. Once you get your look down and find the dress of your dreams you will want to start thinking about making appointments for hair and makeup. When it comes to setting up details of transportation, and who will be riding with you, it is important to make the arrangements early. Talk with the group of friends you want to go with and figure out the details of cost and how long you will have the limo or car for. Hair salons and limousine companies will likely fill up their bookings quickly once prom season comes around. Plan ahead to make sure you get the limo and salon you want. As the time for prom comes closer, you will need to start looking at where you will want to go for dinner, as well as picking out a corsage and boutonniere for your date. Make sure you make reservations for dinner and have the corsage set aside at the florist or grocery store. With prom around the corner it is important to make sure that you confirm all the reservations and appointments that you made to insure an easy and enjoyable day. With all of the appointments and details behind you, spend the day before prom relaxing and pampering yourself in the company of friends!